by Ipsita Roy Chakraverti. HarperCollins India, New Delhi. Rs 250. Pages 200. GHOSTS, witches, tantrics, voodoo dolls, haunted trees and buildings`85. The list can go on and on. We have all at one time or the other indulged our imaginations and dwelt upon the unknown. In Sacred Evil Ipsita Roy Chakraverti leads us into a world where the mystic dwells with the tangible and the unreal is not quite so. The preface, written by the author, starts with a disarming sentence: "At heart, I am a sceptic." The book goes on to prove that she is anything but. Chakraverti, whose chosen field of research has been Wikka, or Dakini Vidya, as it is called in India, is a believer—in the occult, in witchcraft and all things related to these—and this belief shines forth in her writing. It is amazing how lucidly she has presented this very convoluted subject. The book is divided into nine chapters, or encounters, as she calls them. 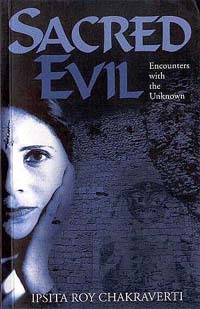 It presents real-life incidents where her powers as a mediating agent with the ‘unknown’ are sought by people "troubled by forces and events they cannot comprehend". The descriptions themselves could well be from the script of a horror movie. They range from a young woman possessed by the evil power of a voodoo doll, a coconut out to kill, a haunted house with the power to communicate, zombies carrying out such mundane activities as plying rickshaws, to Goddess Kali who mesmerises her devotees to a frenzy that can last over a hundred years. There is even a chapter dealing with necromancy, or the power to bring the dead to life. What makes Sacred Evil so interesting is the juxtaposition of modern thought with the ageless. After every chapter there are notes on the practices described in it along with modern explanations. In the chapter on zombies, or the "dead who walk", along with the description of what zombies are, is the possible rational explanation—"there are certain drugs which can induce a deathlike trance. A person administered such a drug and buried is then dragged out`85and used as a slave". This can be done as these drugs destroy the "part of the brain governing speech and willpower." There is a particularly eerie chapter describing an encounter where a dog takes the author to a neem tree oozing a sweet smelling sap, which is somehow evocative of deep sorrow. This happens on the day before the Gujarat earthquake in January 2001, which saw such widespread death and devastation. Somehow, it being a known event makes it more personal and thus scarier. The chapter about the coconut is equally based on the present, where corrupt officials who distort truth are a way of life. It is about an IPS officer who denies justice to a witch-hunt victim and is cursed by her. He is stalked by a coconut, which seems intent on killing him. All the perpetrator had to do was plant a coconut smeared with vermilion in places where the officer would find it, of course, in the book it is the hex that is doing so. "How would the coconut work its magic?" asks the author and answers herself, "I suppose by just sitting there and looking at him and turning him into a blubbering, pathetic, dribbling lunatic". Seemingly "An effective curse does not destroy you. It watches you destroy yourself." Sacred Evil is a very coherent account of the author’s dealings with witchcraft and sorcery. Unfortunately, it could add to superstition, which is already prevalent at an unhealthy level in our country. As a work of fiction it would have been laudable; given the cover of truth it becomes a dangerous piece of writing. Ipsita Roy Chakraverti was at the time of publication of the book secretary of the West Bengal Pradesh Congress Committee, in charge of women’s affairs and the under-developed areas of Bengal. This should have made her more sensitive to the danger of reviving the declining interest in mysticism and the dark arts.